As every parent knows, kids are surprisingly clever negotiators. But how can we avoid those all-too-familiar wails, “That’s not fair!” and “You can’t make me!”? In The Game Theorist’s Guide to Parenting, the award-winning journalist and father of five Paul Raeburn and the game theorist Kevin Zollman pair up to highlight tactics from the worlds of economics and business that can help parents break the endless cycle of quarrels and ineffective solutions. 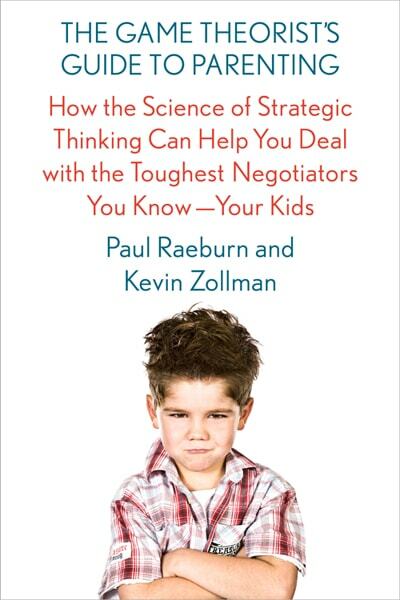 Raeburn and Zollman show that some of the same strategies successfully applied to big business deals and politics―such as the Prisoner’s Dilemma and the Ultimatum Game―can be used to solve such titanic, age-old parenting problems as dividing up toys, keeping the peace on long car rides, and sticking to homework routines. Raeburn and Zollman open each chapter with a common parenting dilemma. Then they show how carefully concocted schemes involving bargains and fair incentives can save the day. Through smart case studies of game theory in action, Raeburn and Zollman reveal how parents and children devise strategies, where those strategies go wrong, and what we can do to help raise happy and savvy kids while keeping the rest of the family happy too. Delightfully witty, refreshingly irreverent, and just a bit Machiavellian, The Game Theorist’s Guide to Parenting looks past the fads to offer advice you can put into action today. Raeburn and Zollman "put the math on the back burner and bring the commonsensicality of the theory to the fore” with “tantalizing perspectives on cultivating sharing, honesty, and cooperation—via game theory." Unlike most parenting books, this one is based on actual research into how humans behave. It should increase the odds that there will be less whining for all involved.